In a career spanning 16 seasons and 324 games, Scott West was one of the Western Bulldogs’ greatest servants. Not blessed with pace, West was a tough “in-and-under” midfielder who was hard at the ball, especially around the stoppages, and was regularly one of the leading possession accumulators in the competition. His work-rate and courage were unsurpassed and West was a key factor in the Bulldogs’ reaching the finals in 1994-5, 1997-2000 and 2006. 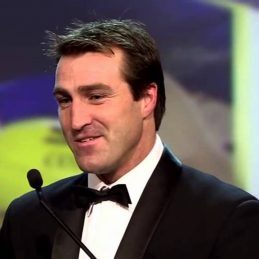 West came desperately close to winning football’s highest individual honour, the Brownlow Medal, on several occasions, finishing runner-up in 2000 and 2006, third in 1998 and fourth in 2004-05. West won a club-record seven Charlie Sutton Medals as best and fairest for the Dogs, and was named All Australian on five occasions. Ranked by many as one of football’s greatest midfielders, if there was one criticism that could be levelled at West, it was his inability to ‘break the lines’ and his relatively low scoring output (he kicked only 104 goals in his career with six of those coming in just his fourth game). Nevertheless, his hand skills were exquisite and allowed him to extract the ball from the tightest of situations and distribute to players who could indeed break lines and kick goals. Incredibly durable for the vast part of his career, a chronic knee injury reduced him to just a handful of games in 2008 and ultimately forced his retirement. After hanging up the boots, West served as an assistant coach at Melbourne for several years, although it was clear even then that the Bulldogs remained close to his heart, as he was often ‘a face in the outer’ at many Bulldogs games during this period. In 2012 he was appointed coach of VFL side Werribee. He took the Tigers to Preliminary Final losses in that season and the next before resigning from the post.